FRANCE – – Grand - Entre juin et octobre 2011, en amont de la création d’un lotissement, une fouille menée à Grand a permis la mise au jour d'une imposante villa au pied du rempart de l’agglomération gallo-romaine. Durant l'Antiquité, Grand est identifié à un sanctuaire des eaux dédié à Apollon Grannus. La découverte d'enduits peints permettent d'en restituer les décors et d'identifier la fonction de ses nombreuses pièces. La fouille d'une villa de cette envergure et de ce luxe dans son intégralité et dans un milieu urbain antique est rarissime. INDE – – Assam - Rangamati Mosque, the oldest mosque in Assam, preserved by the Archaeological Survey of India (ASI), is suffering for lack of maintenance and apathy. Also known as the Panbari Mosque, it was built during the 17th century by Hussain Shah, the Governor of Bengal and is a fine example of pre-Mughal architecture. It is situated nearly 25km from Dhubri town. Rangamati was once a very prosperous area during the reign of the Koch rulers and used as a frontier post. During the Mughal regime, Rangamati was a great fort, also used for prayers. It also comprised an Idgah and a deep well, constructed during the same period. ROYAUME UNI – Londres - One Saturday afternoon in September 1954, a handsome, faintly smiling god looked up from the London mud. His name was Mithras, and the rediscovered Roman temple to his cult became a sensation in a gloomy postwar capital pitted with bombsites and still recovering from rationing. 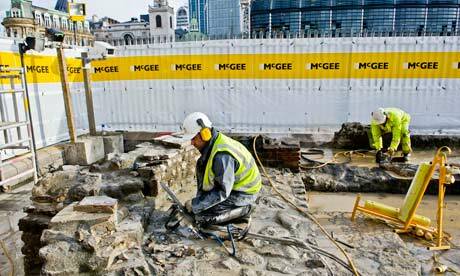 The temple was also about to become Britain's most mobile Roman site. Fifty-seven years ago it was in the way of an office block development and was dismantled and moved to the street level roof of a car park, part of the huge Bucklersbury House development. Now it is on the move again, back to the banks of the long vanished Wallbrook stream, to make way for the headquarters of Bloomberg. Mithras was a virile young god whose cult spread across the Roman empire from the east and was particularly beloved of soldiers. He was worshipped in cavelike, partly underground spaces where initiates gradually learned of his mysteries in the torchlit darkness. The temple originally had a sunken nave flanked by seven symbolic pairs of pillars leading to the altar, a ritual well and raised seating on either side. It was rebuilt all on one level. A structure where worshippers were gradually initiated into mysteries through darkness and fire lay exposed to the elements on top of a car park. And a wild decision was taken to fill in the floor with crazy paving, giving it the appearance of a suburban back garden feature. AFRIQUE DU SUD - Cape Town - Anthropology professor Stephen Lubkemann has spent two years pinpointing the site of a shipwreck near Cape Town, that killed more than 200 slaves being transported between East Africa and the Americas during the 1790s. If he reaches the sunken ship, he says the findings will add the first archaeological evidence to the 18th-Century slave trade. FRANCE – Fains-Véel - Depuis quelques jours, une camionnette estampillée Inrap stationne devant l’église Sainte-Catherine à Fains-Véel, village de 2.300 habitants, situé à quelques kilomètres de Bar-le-Duc. À l’intérieur, trois archéologues ont déjà mis au jour plusieurs squelettes. « Nous avons, en différents endroits, effectué des sondages afin de vérifier la présence ou l’absence de traces archéologiques. 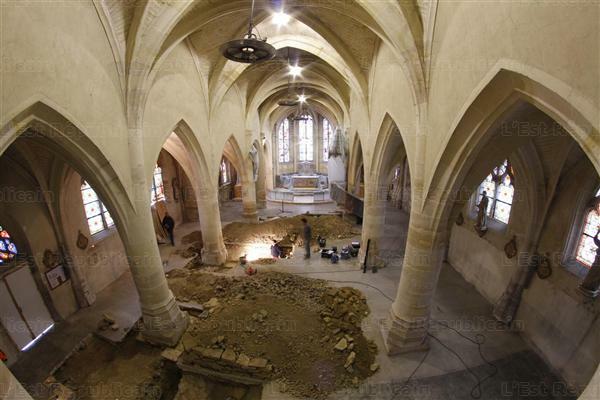 Comme c’est le cas à 99 % dans ce genre d’endroit, nous avons dégagé plusieurs tombes et un caveau contenant de nombreux ossements, dont huit crânes alignés comme il était de coutume. Lorsqu’une nouvelle personne trépassait, on ouvrait le caveau familial et l’on disposait les crânes autour du nouveau cercueil. On rebouchait en mettant les os restants en vrac avec la terre. On peut affirmer que ces tombes s’échelonnent du XV e au XVIII e siècles. Nous avons également trouvé des squelettes d’enfants et même des fœtus », explique Franck Gérard, qui avec Denis Bourada et Nadège Ramel, est en charge de vérifier si les travaux, qui vont permettre l’installation d’un chauffage au sol, ne vont pas détruire des vestiges archéologiques. À l’issue de ces fouilles qui devraient se poursuivre jusqu’à vendredi un rapport précis permettra de prendre une décision. Trois possibilités sont envisageables. Les travaux peuvent commencer car rien ne risque d’être détérioré. La surveillance d’un archéologue sera nécessaire afin de ne rien endommager et d’intervenir en cas de découverte, ou les travaux seront suspendus et une campagne de fouille sera engagée. AUSTRALIE – Frederick Reef - The marine archaeology expedition to uncover the history of the Royal Charlotte is nearing an end but plenty of exciting discoveries have been made along the way. A team of Australian National Maritime Museum archaeologists have been out on Frederick Reef since January 4 for the search and survey mission to find the ship, which was wrecked on the reef in 1825. 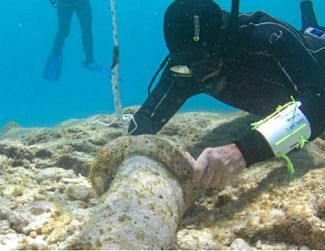 Australian National Maritime Museum senior curator and archaeologist Paul Hundley said in the expedition's blog that, during a scuba survey of the outside coral reef, divers located a copper fastening, keel staples and a large piece of lead, which may weigh more than 500kg. The expedition team is expected to return to Gladstone Harbour on Sunday. ROYAUME UNI – Sheriffside - The excavation of a "crucial" historic fort settlement near Gifford, dating back to the beginning of the first century AD, is to be expanded later this year with a further archaeological dig at the site in April. More than 200 people - including East Lothian schoolchildren, archaeology students and adult learners - were involved in the excavation led by Rampart Scotland (RS) at an enclosure site at Sheriffside in May last year. The dig, funded by Haddington's Peter Potter Gallery and carried out as part of RS's Hill Forts of East Lothian project, yielded a number of interesting items and a variety of features, including rock-cut post-holes, channels and a cut terrace in the hillside. The Sheriffside site was first discovered in 1981 and identified as a double-ditched enclosure, representing a ploughed-out and flattened hill fort whose ditches survive below the ground and affect the growth of crops. No further investigation of the site was carried out until Rampart Scotland undertook last year's programme of geophysical survey and evaluation to characterise and date the enclosure as part of its ongoing 'Hill Forts of East Lothian' project. Excavation of the site revealed that it was not, in fact, an enclosure but a platform settlement dating to the closing centuries BC and the early first century AD. However, it is still not clear if there is in fact an enclosure on the site which may have been superseded by the platform settlement. A number of artefacts were unearthed during the excavation, which was carried out in a single trench, including polishing stones, a hand-thrown ceramic shard and charcoal.